The Android Home Screen may differs with every smartphone and it entirely depends on the phone model.For example, the HTC phones usually come with the HTC Sense UI, and the Samsung Android phones come with their own interface. Once you have done the initial setup of the phone, the home screen welcomes you with what you would always be seeing from now on. 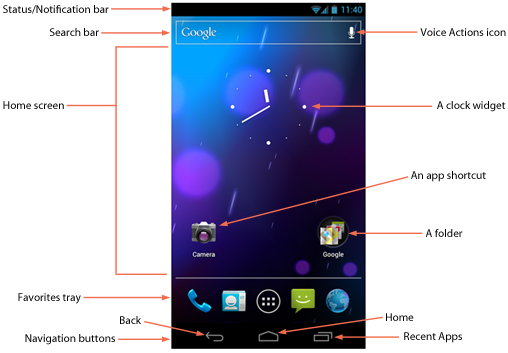 The standard home screen would have the shortcut icons in the bottom, a few widgets and shortcuts at above and the top strip called the notification panel with the various status icons. These are the shortcut icons for the Phone, Contacts, Text Messaging, App pages etc. The app list icon is usually located in the center or right corner based on the interface of the phone. Below the icons, mostly 3-4 navigation buttons are there and that too depends on the phone model, could be either touch sensitive or physical ones. These are the Menu, Back and the Home keys. The status icons are one of the important icons located in the Notification panel, which always have the time and network status on the right side. Several Status icons are there which include Unread text Messages count, Missed call alert icons, Data Network icon like “E”, “H”, “3G” for the data network connection status. Even apps notifications will show in the same panel as the status icons. Whenever you connect your Android Phone to the computer via USB Cable, the USB icon appears on the tray and shows various connectivity statuses such as Bluetooth, Data network, GPS navigation, Wi-Fi etc. There are several other status icons that keep changing based on what the phone wants to notify us about the current status of the network, battery, data network, time, alarm, Connection of headphone, GPS, Connectivity, Phone Ringing mode etc. Most of the Android phones got more than one home screen and is usually between 3-7 home screens with a few shortcuts, icons and widgets already present. 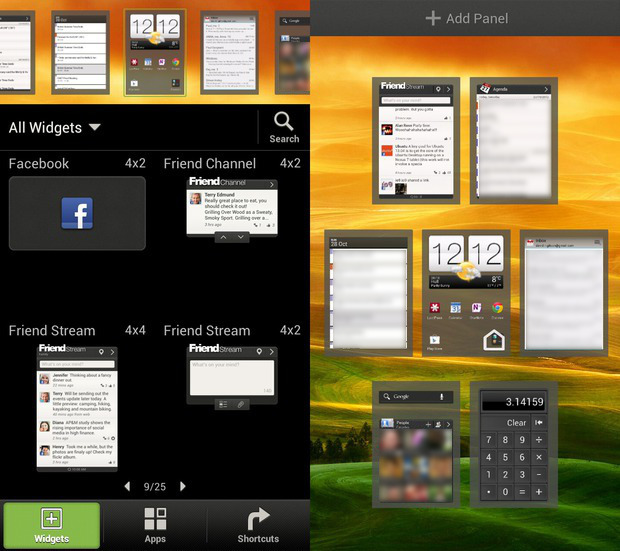 The widgets that can be placed on the home screen include mainly the Google Search, Connectivity tray, Weather widgets and various other that one can place when they install any new applications. How to Make changes in the Home screen? If you want to change the home screen, like changing the wallpaper or addition of widgets/shortcuts just long press the home screen in the empty area and it would show up the options to make the changes and this again depends on the phone. 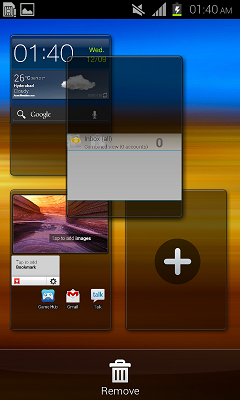 The Samsung Android phones show up the menu to make the changes in the bottom area overlapping the shortcut bottom icons, while the Motorola phones show the options only to change the wallpaper on the long press of the home screen. How to Shift the place of the Home screen? 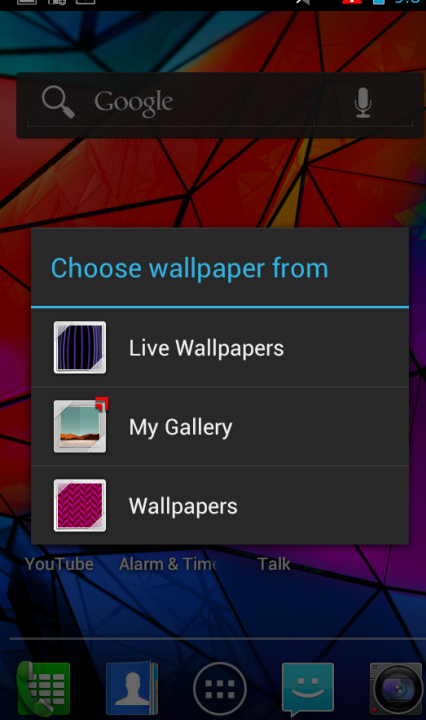 If your android phone has multiple home screens and you want to shift the particular home screen which has all necessary widgets then you can easily do that especially if you have Samsung Android phones. For that all you need to do is just pinch the home screen and bring all the home screens at one place, and drag the particular home screen you want and place it on the convenient place.